Welcome back to Creative Kids – where I share guest bloggers and the art, craft & messy play activities they get up to with their kids. Today I’m sharing an absolute classic paper craft that definitely deserves a remake from Sarah at Experienced Mummy. The other day, my son and I worked on a craft that’s perfect for anyone, even non-crafty people. I know this because he and I are both “non-crafty people.” We are, in fact, so non-crafty that this is the first project that we’ve done together at home even though my son is six. Read below to find out more about this perfect craft for non-crafty people. My son had asked to borrow a piece of high-quality printer paper. I hadn’t realized it at the time, but he decided that he was going to draw a glorious rendering of a fidget spinner. Unfortunately, the inability to draw is also something that he and I have in common. When his picture didn’t turn out, he was devastated. I found him almost on the verge of tears with a crumpled paper and a sunken spirit. Desperate for a way to cheer him up, I dug deep in my memory for something that I could do with a sheet of slightly crumpled, slightly drawn on paper. In a flash, I remembered how to make a paper fortune teller. Smooth out your paper if it’s crumpled like mine was. You need to make a square. If you’re using an 8.5” x 11” sheet of paper, take the top right corner and bring it toward the outside edge of the left side of the paper. You want to bring it across so that the top left corner of the paper makes a nice, even point. Fold the rectangle at the bottom of the sheet of paper up over the bottom edge of the paper. Crease the fold firmly. You can get scissors to cut off the extra, but I like to either fold the rectangle back and forth or lick the fold so that the rectangle can easily tear away from the folded paper. Once the rectangle is gone, you have a triangle. Unfold your triangle so you have a square. Fold your square into a triangle going the other way. Make sure that both folds open inward. Take the bottom right corner and fold it toward the center so that the tip of the corner now touches the center of the square. Repeat step 8 for the other corners of the square. Make sure that, as you fold, the seams line up next to each other without overlapping. Take your new, smaller square and flip it over. Your square should look smooth except for the creases in the paper. Repeat step 11 for the other corners of the square. Make sure that, as you fold, the seams line up next to each other without overlapping. Now, fold your new square in half. As you do this, you’ll notice that you reveal two of your folded squares. Fold your square the opposite way. Grab at the bottom of the fortune teller with both hands. 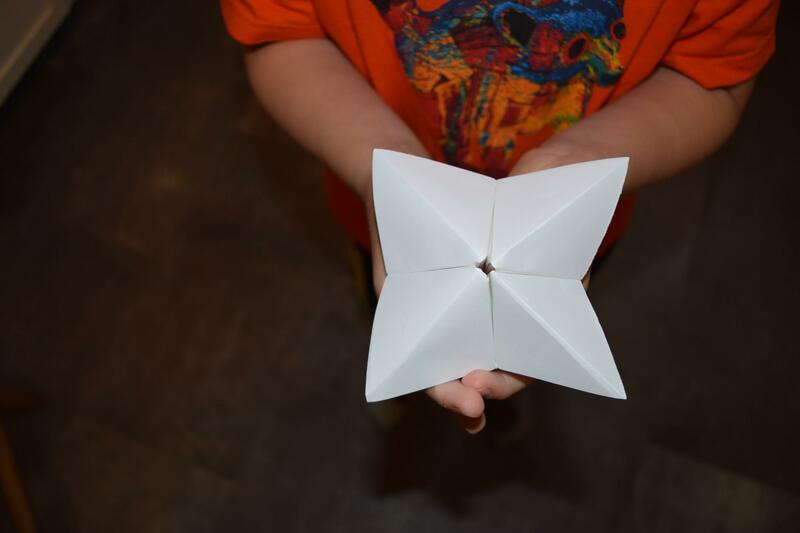 Your left thumb and pointer finger go in the boxes on the left side of the fortune teller with your right thumb and pointer finger on the right side. Right now, your fortune teller is blank, so the world is your oyster. You can really do whatever you want to fill it in, but here’s what I do. Put a colorful dot on each outside corner and write the name of the color beneath it. This helps kids learn to spell colors. Once you open the fortune teller, write a number in each section. Because of the 8 sections, I use the numbers 1-8. Open each flap and write something in each section. Since my son was feeling really down on himself for not being able to draw a fidget spinner, I wrote something nice in each section. His fortunes are: I love you, You’re the best, Everyone loves your smile, You’re the coolest, You make me happy, You’re really smart, You are so talented, and Today will be the best yet. Again, feel free to write whatever fortunes you choose. It’s kind of silly, but you work the fortune teller like a mouth. First, ask your child to pick a color. Spell the color they chose, moving your hands one time for each letter you say. When you finish, your fortune teller “mouth” will be open with part of your numbers showing. Have your child choose one of the visible numbers. Count up to that number, moving your hands one time for each number you say. Have your child choose one of the visible numbers again. This time, lift the flap and read the fortune that’s written beneath. 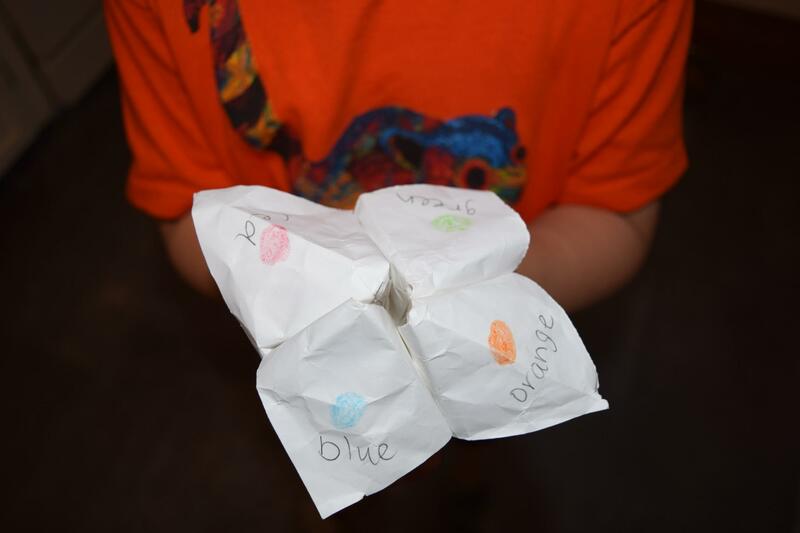 Now that you have your paper fortune teller complete, let the fun begin! After we made our first fortune teller, we spent probably thirty minutes or more telling each other’s fortunes. I hope that this project brings as much joy to you and your kids as it did to mine. After graduating from TCU with a degree in English, I took a break from writing. 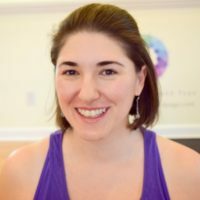 After accumulating some life experiences and children, I returned because I finally had something to say. I write for Experienced Mommy and I’m passionate about helping people be their best. 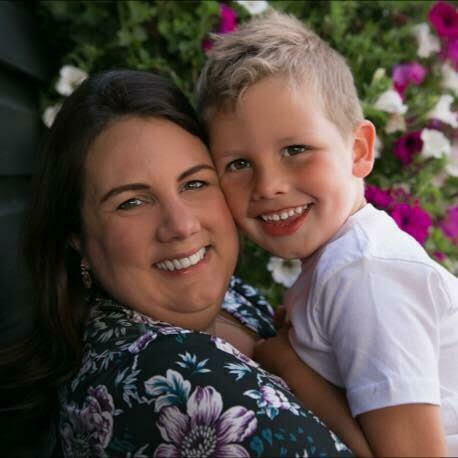 Whether it’s giving advice for success in parenting or information about how to improve your personal health, my top priority is to give you the best information possible.